In 2006, Kim introduced me to the ideas of Rudolf Laban, his theories about the kind of effort that people use when they move, and how she thought that his ideas would apply to handbells. After directing and teaching handbells for over 25 years, I was hearing cutting-edge information that could have a dramatic impact on handbell ringing and musicianship. Since then I have been incorporating her ideas into my teaching, and I'm amazed at the dramatic change in the musicianship of my handbell groups. Kim's ideas have had a profound impact on my career as a teacher and conductor. I became acquainted with Kim Strepka’s work with Laban movement theory and handbell musicians at the Handbell Musicians of America (then AGEHR) National Seminar in 2011. Since that time I have eagerly soaked up all that Kim has shared with our community. After implementing the language of Rudolf Laban and Kim’s insight on its application to the art of handbell ringing I have experienced greater musical expression, artistry and musicality in the ensembles I work with. These musical results have inspired me anew in my teaching and given me cause to take a closer look at how I teach and direct. THANK YOU to Kim for sharing this important and ground breaking work with our community! The information Kim provides is vital! It is natural to move to music. Our arms and bodies already move as part of the act of ringing bells, so it is impossible to overestimate the importance of developing a movement vocabulary that encompasses types of motion, use of space, stances and body language, translating movement into musical terms and back again. In my years with the Pikes Peak Ringers, we developed a toolkit of movements focused on how to communicate the music visually in our ringing. Kim has developed a deeper and broader set of tools that goes well beyond the visual and has far-reaching and lasting effects on musicianship, artistry, confidence in ringing, translation of the score, and much, much more. 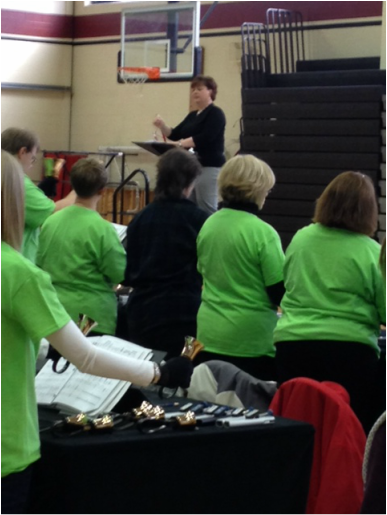 Every handbell choir, regardless of experience level, will benefit from Kim's teaching and information.